Running is one of the world’s simplest sports, so you might feel frustrated about how complex it can be to recover when you’re trying to increase your mileage. Hours of long runs can translate into hours of swelling and pain as you start running further and further, and without proper recovery, your body starts to suffer and you can’t meet your distance goals. Running and recovering from long runs don’t have to be so painful or challenging. Your running gear, especially your socks, can make a big difference in how you feel during your run and how quickly you recover after you’ve finished. Running places a unique strain on the body. When you run, especially over long distances, the majority of the force you use to strike the ground must be absorbed by your feet and legs. This causes your body to stimulate a painful nerve response, which is why you can start to feel sore as you keep racking up the miles. During a workout, you can also feel a burning feeling caused by a buildup of lactic acid in your muscles. This occurs because of your body is not able to keep up with oxygen demand required to complete the exercise. Without oxygen, your body must use anaerobic processes to provide the energy you need. Lactic acid is a by-product of this process. Once you decrease the demand for oxygen (rest), your body can catch up and the lactic acid dissipates fairly quickly, which is why the burning sensation goes away when you reduce the intensity of your workout. After you’ve finished running long, particularly when you’re continually breaking your old mileage record, your body will complain with gradual soreness that builds up over the course of several hours or even several days. This is called delayed onset muscle soreness (DOMS). DOMS occurs because you actually cause damage to your muscles when you push them harder than you have before. Microscopic tears form in your muscle fibers, and you feel pain until the muscle can repair itself. Now that you know why running can sometimes cause pain, what might socks have to do with improving your recovery? Wearing supportive, breathable socks during a run can help prevent minor injuries that will affect your gait. Thin socks that rub against your skin during a run can lead to chafing and blisters. These cause pain, and to avoid the pain, you start stepping differently. This taxes your muscles differently than they are used to, and eventually, you end up with a strain or sprain. More importantly than simple socks, however, you can also choose compression socks for recovery purposes. Some runners choose to wear compression socks on long runs to help prevent injury, but others will only wear them after a run. Whichever option you choose, custom compression socks offer the following benefits for speeding your body’s healing after a run. One essential part of recovering from those tiny tears that cause DOMS is increased circulation. Your cells need oxygen to repair the muscle fibers, and increased blood flow to the affected area can help make that possible. 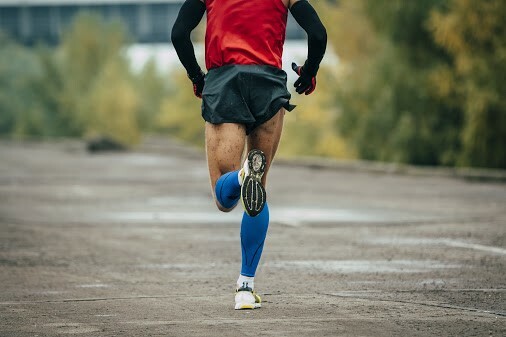 Runners who wear compression socks after runs recover faster from the run and are ready to begin training again sooner. When worn during a run, the increased circulation helps with oxygen delivery. That lactic acid that causes those sharp pains builds up more slowly and dissipates more easily with increased blood flow. Inflammation can cause your feet and legs to swell. On long runs, this swelling is not only uncomfortable, but it can be painful, especially for the feet. Compression socks are useful for reducing swelling in those who spend all day on their feet, and those who run long can experience similar discomfort. Not only can reduced swelling help you perform better on the run with less pain, but wearing the socks after a run can also keep swelling at bay. When combined with other treatment methods like alternating ice and heat, rolling out sore areas and taking anti-inflammatory medicines, you might find that your overall ability to stay the course for long runs improves. While there are some noted physical benefits from the compression socks, every runner knows that long runs are a mental game as much as a physical one. Pain during a run can kill your motivation and increase your fear of injury. You might run slower than you normally would if you fear injury or severe soreness. When you have well-fitted compression socks, you have increased peace of mind that you can complete the course without the same levels of discomfort you might have felt before. With that peace of mind comes a drive to run faster and better. For more information on running and compression socks, contact us at SmoothToe.